Complete with brown sugar cake and a mini cookie topping! 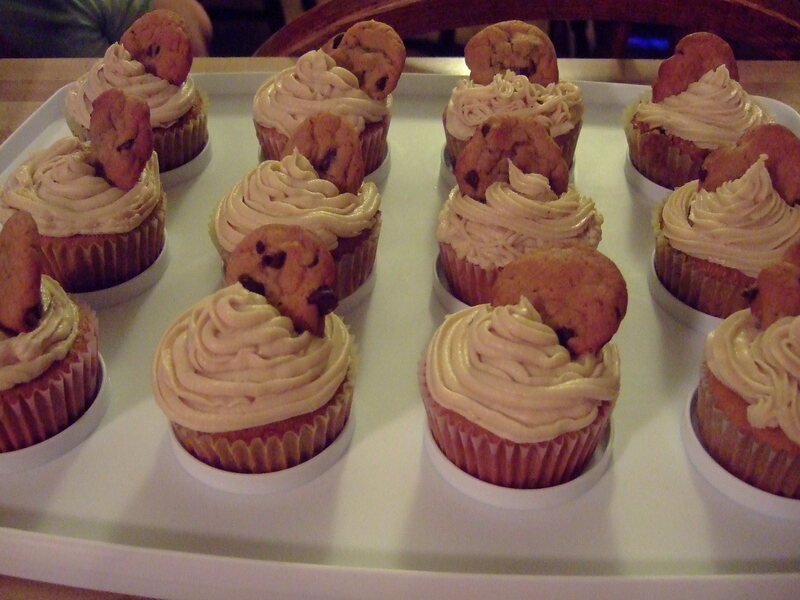 These can be made with your favorite chocolate chip cookie recipe, the following Brown Sugar Cupcake, and Cookie Dough Frosting. Place dough in the freezer until it is firm enough to be rolled into little balls, about 3/4 inch in diameter. Place the rolled balls back into freezer until completely frozen. This dough must be completely frozen in order to produce the nice gooey dough center. You do not want the dough to actually bake into a cookie. Don’t forget to save some for the mini cookies! Chill the dough and tiny scoops onto a cookie sheet, evenly spaced. Baking according to your favorite recipes directions, or about 7 minutes. Remember these will be mini, so they will bake quickly! Beat butter on high until soft, about 30 seconds. Add sugar, and beat on medium-high until light and fluffy, about 3 minutes. Add eggs one at a time, beat for 30 seconds after each until incorporated. Add about 1/4 of the flour to the butter/sugar mixture and beat to combine. Add about 1/3 of the milk/vanilla mixture and beat until combined. Repeat above, alternating flour and milk mixtures and ending with the flour mixture. Place previously prepared frozen cookie dough ball into cupcake liners, and then fill cups to about 3/4 full with batter. Bake for 20-22 minutes, until the cake springs back when lightly touched. 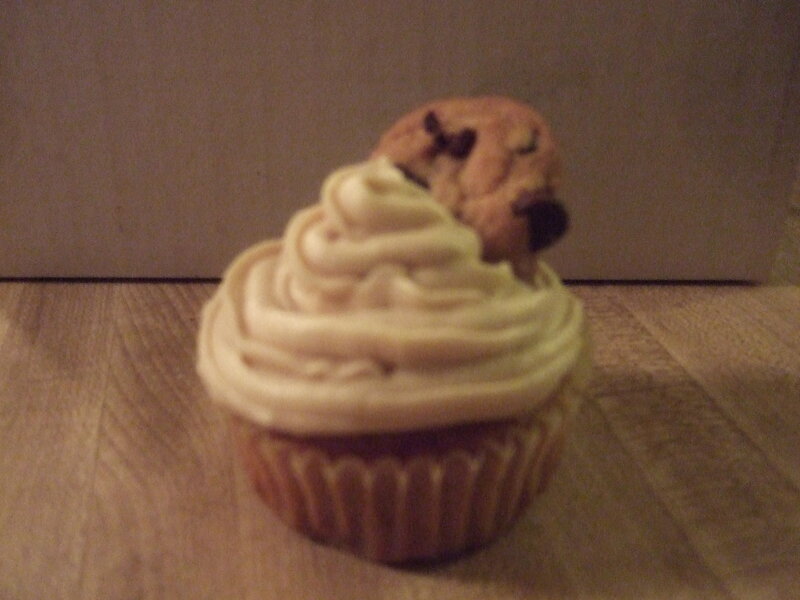 Do not use a toothpick to test if they’re done because of the gooey cookie dough in the center. In the bowl of an electric mixer fitted with the paddle attachment, combine 1 1/4 c. confectioners’ sugar, unsalted butter, salt, and vanilla, scraping down the sides of the bowl with a spatula as necessary. Add milk and continue mixing until well combined, scraping down the sides of the bowl with a spatula, as necessary. With the mixer running, slowly add remaining 1/2 c. confectioners’ sugar, mix until well combined. At this point you can mix in the eggless cookie dough. Mix in enough cookie dough to suit your taste. Any cookie dough left over you can gladly eat! There are no eggs in it so it is safe. Cream the butter and brown sugar in a small bowl. Add water and vanilla and mix well. Add flour and salt and stir to combine. Stir in mini chocolate chips, if desired. Store in refrigerator until ready for use.